Eastern Long-Necked Turtle. Image by Ian Moodie. The shell of the Common long-necked turtle is up to 25cm in length and varies in colour from light to dark brown to black. Its neck is almost equal in length to its body. It is slow moving and migrates overland in the warmer months following the rain. To avoid predators and water loss, it can turn its head sideways to completely withdraw it, along with its neck and limbs, under its shell. The Common long-necked turtle lives in swamps, billabongs, slow-moving creeks and rivers, which provide a safe haven from many predators as well as providing sources of food. They are found throughout the outer Melbourne area, and are commonly found in Willsmere-Chandler Park and Koonung Creek Reserve. 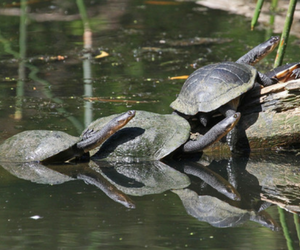 The Common long-necked turtle is a protected species and is not to be taken from the wild. In Boroondara, it is listed as vulnerable. The Common long-necked turtle is vulnerable to changes in water levels (e.g. as a result of drought). Their nests and hatchlings are also vulnerable to predators such as foxes, rakali (indigenous water rats) and ravens. Marbled Gecko. Image by Ian Moodie. The Marbled gecko is a small, soft-bellied lizard up to 70mm long. It is easily identified by its large finger and toe pads, which spread out to grasp slippery or soft surfaces. It lacks moveable eyelids and uses its tongue to keep its eyes clean. It is insectivorous by nature but will eat anything small enough to fit in its mouth. In summer, females usually lay one clutch, containing two eggs at a time. During the day the Marbled gecko can be found in woodpiles, fallen timber or logs. At night, they can be seen around external lights, feeding on insects attracted to the light. 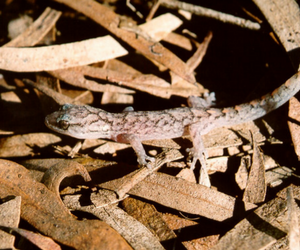 The Marbled gecko is listed as an endangered species in Boroondara and is rare in Melbourne. To help protect the Marbled gecko, avoid using chemical sprays and insecticides, and keep cats in at night.